Source: Eduardo Marzo, ed., Songs of Italy; sixty-five Tuscan, Florentine, Lombardian and other Italian folk- and popular songs. (New York: G. Schirmer, 1904), p. 144. Era notte e parea mmiezo juorno! Jette a chiammà li Magi, in Oriente. E co lu lupo 'npace u pecoriello. La terra è arrenventata Paradiso! Sheet Music from Marzo, Songs of Italy, pp. 142-143. The carol is traditionally played on the zampogna (a type of large, sweet-toned bagpipe with two drones and two chanters) and the ciaramella (a small clarinet or shawm) by groups of between two and four shepherds who come from the mountains to the villages and cities throughout Italy and Sicily, notably Rome and Naples. The shepherds would serenade private homes and statues of the Virgin Mary in the Octave (nine days) before Christmas. I Zampognari. They come to Naples from the mountains of Abbruzzi at Christmas-tide, and go about from house to house playing and singing before the image of the Holy Infant during the Novena (the nine days before Christmas). There are generally two, who go together, one playing the bagpipe, and other a species of small clarinet called Ciaramella. 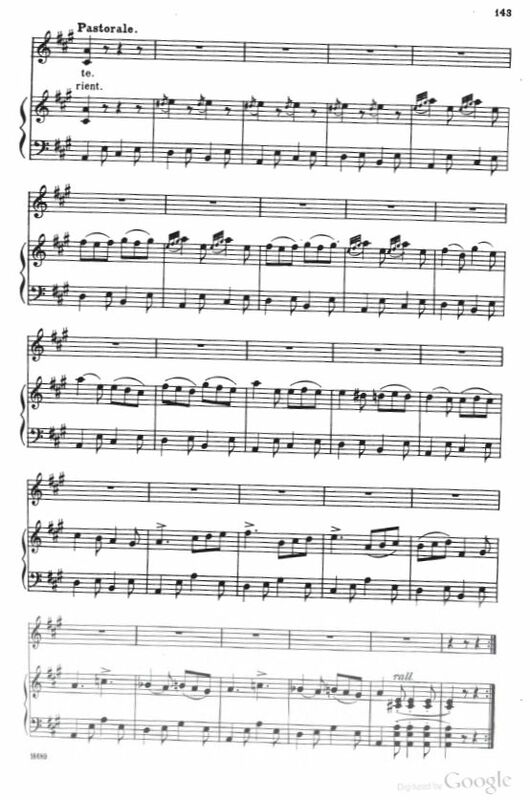 The music which is given here is played by them with some little change, and while the bagpiper continues the accompaniment, the one who plays the clarinet stops to sing the different stanzas of this Pastorale. It is particularly interesting from the pastoral character of the music and the beautiful poetical ideas of the words. In all probability the melody suggested to Handel the theme of his pastorale in The Messiah. The carol can be played by two, three, or four musicians. If three or four are performing, two will continuously play the music while the extra one or two sing the lyrics. On the continent the custom of carolling at Christmas is almost universal. During the last days of Advent, Calabrian minstrels enter Rome, and are to be seen in every street saluting the shrines of the Virgin mother with their wild music, under the traditional notion of charming her labour-pains on the approaching Christmas. Lady Morgan observed them frequently stopping at the shop of a carpenter. In reply to questions concerning this, the workmen who stood at the door said, that it was done out of respect to St. Joseph. [Lady Morgan's Italy, c. xxi]. I have an old print of this practice. Two Calabrian shepherds are represented devoutly playing at Christmas in a street of Rome, before a stone shrine, containing a sculpture of the Infant Jesus in the Virgin's arms lighted up by candles, with a relief under it of supplicating souls in purgatorial fire, inscribed 'Dite Ave Maria.' A young female, with a rosary, is praying on her knees before the sculpture. The shepherds stand behind and blow the bagpipes and a clarionet. This carol was featured in an article in the North American Review (Vol. 35, No. 77) titled "History of the Italian Language and Dialects," pp. 283-342 (October, 1932). The Italian texts were from Saggi di Prose e Poesie de' piu celebri Scrittori d'ogni Secolo. VI. vol., 8vo., selected by Professors L. Nardini and S. Buonaiuti (London, 1798). The link above is to the copy found at the Library of Congress. The volume is also available at Google Books, as are volumes 1-2 and 5-6 of Saggi di Prose e Poesie. The Neapolitan is one of the master-dialects of Italy. In its train it counts several under-dialects, such as the Pugliese or Apulian, the Sabine, and that of the island of Capri. Even in Naples, the different quarters of the city are marked by different jargons, though it is not to be supposed that these subdivisions exhibit any varieties so striking as to diminish the universal sway of Puicineila, or to prevent that monarchs voice from being understood in every nook and corner of his own peculiar dominion. ... We select our illustrations of the Neapolitan dialect from among the popular songs of the country. The next extract will exhibit the dialect of the Neapolitan peasantry It is a Pastorale de Zampognari, one of those little rural hymns, which the zamjpognari or pipers from the Abruzzi and Calabrian mountains sing before the images of the Virgin at the corners of the streets in Rome and Naples, at the season of Advent, accompanied by the sound of their rustic bagpipes. The text then quoted three verses of this carol, substantially the same as above. The original Italian poem is said to contain 24 verses. See: Quanno nascette Ninno at Da Wikipedia, l'enciclopedia libera. It is widely reported that Handel may have adopted pipe music with his so-called 'Pipers Carol' or 'Canzone d'i Zampognari' which he used for "He Shall Feed His Flock Like a Shepherd" in "Messiah." He may have heard this melody during a visit to Naples in 1708, 33 years before composition of the oratorio. 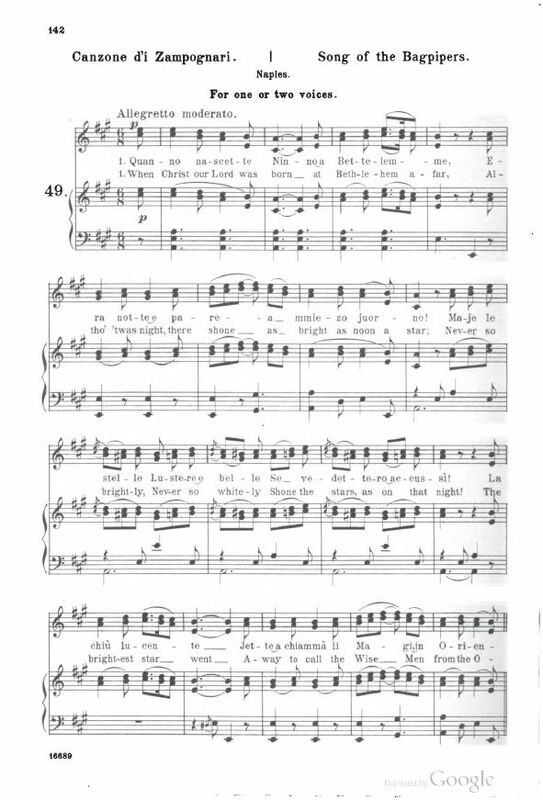 Note that Ruth Heller added the note that "From this ancient carol Handel developed the melody of "Come Unto Him," a famous aria in his oratorio The Messiah." Carol of the Bagpipers (Simon Translation, 1973) ("And when the Child was born / At Bethlehem, where He lay,"). Henry W. Simon, ed., A Treasury of Christmas Songs and Carols. Second Edition. (Boston: Houghton Mifflin Company, 1955, 1973), pp. 100-101. Carol of the Bagpipers (Canzone d'i Zampognari). Ruth Heller. ("A star shone up in heaven the night the Child was born."). Ruth Heller, ed., Christmas. It's Carols, Customs and Legends (Minneapolis: Schmitt, Hall & McCreary Company, 1948), pp. 68-69. Also found in her Carols of the Nations (Poole: Blandford Press, 1955), pp. 43-44. A version based on this translation was recorded by "The Joy Strings" musical group on their album “Carols Around The World” (the Regal Zonophone label of the Columbia Graphophone Company Ltd.). "On That Most Blessed Night" (Bagpiper's Carol). Translation and arrangement by Marx Oberndorfer, from Noels: A Collection of Christmas Carols (Chicago: H. T. FitzSimons Company, 1932), p. 58. Carol of the Bagpipers (Il Zampognari). Fr. Gordon Hitchcock. ("When Jesus Christ our Lord / Was born at Bethlehem"). Erik Routley, ed., University Carol Book (Brighton: H. Freeman & Co., 1961), # 149, pp. 198-199. Quando Nascette Ninno ("When Christ, the Son of Mary, / in Bethlehem was born," an adaptation of the Gordon Hitchcock translation). Hugh Keyte and Andrew Parrott, The New Oxford Book of Carols (Oxford: Oxford University Press, 1992), #201, pp. 652-653. Neither "The Star Carol" by Hutson and Burt, nor "The Shepherd's Pipe Carol" by John Ritter, nor When Christ Was Born In Bethlehem (Housman, 1906), are based on this carol. See also When Christ Was Born of Mary Free and When Christ Was Born Of Pure Marie.